Go Wild on a cruise! Bumping over the bone-shaking track, I strained my eyes, trying to get a glimpse of our ‘prey’. Nothing. ‘Not long now’ our driver reassured us, even though we’d been searching for a couple of hours. And then we rounded a corner and slowed. ‘There’, our guide whispered but still i couldn’t see anything. A tree beside us rustled. Then another, and suddenly to left of us an elephant emerged with her calf following close behind. They meandered across the track in front of us and i almost cried. The closest i’d ever come to elephants in the wild was through my TV screen, watching a David Attenborough documentary about some far-flung destination. Now, here i was in Sri Lanka, watching a mother and her little ‘Dumbo’ up close while on safari. You too can venture into the wild to spot the Big Five and other exotic animals while on a cruise. Whether you want to watch whales in Alaska or try to p-p-pick up a penguin in Antarctica, there’s a ship to take you there. Find out how to get up close to fascinating fauna on a wildlife cruise on page 22. 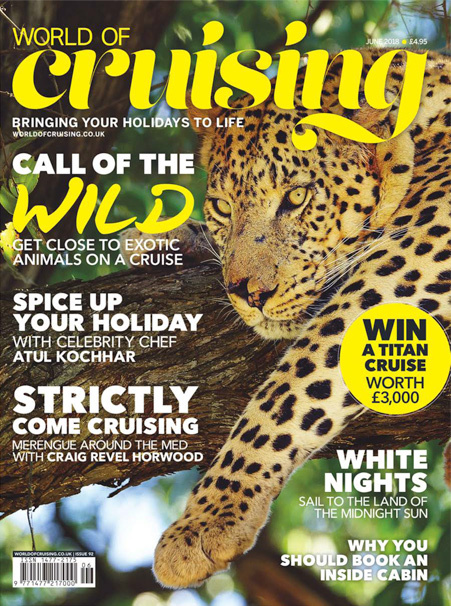 Living in close proximity to your friends might also drive you wild, according to experts, and so on page 46 we tell you how to survive a cruise without turning your BFF into a frenemy. And we’ve been on board the latest ships to have launched. Find out how we fared speeding around the racetrack on Norwegian Bliss (page 58) and doing the conga on Carnival Horizon (page 94). You might want to try them out for yourself or venture further afield. Why not head to the Land of the Midnight Sun (page 52) on your next voyage where the sun never sets. It means you don’t need to sleep as much so you can pack more into your holiday.